Earthquakes occur when the earth's crust breaks and Compressional (P), Shear (S) and Longitudinal (L) waves travel from the Focus upwards to the Epicentre, along the surface (L waves) and downwards (P & S waves) to the earth's core and outwards where they are recorded when they reach the surface. Using tables involving start times and arrival times as recorded on seismograms at different stations around the world, the distance to the Epicentre and depth to the Focus can be accurately determined. Fault patterns. 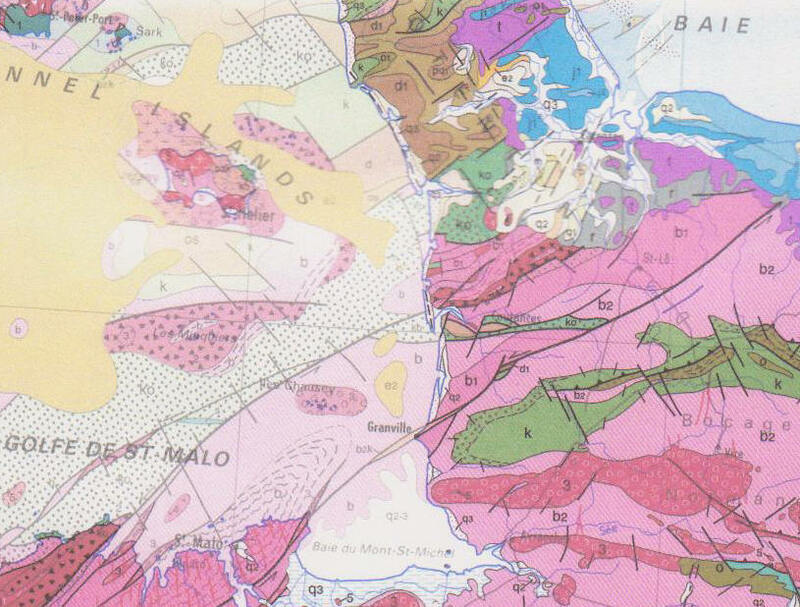 Carte Geol. de France 2003. 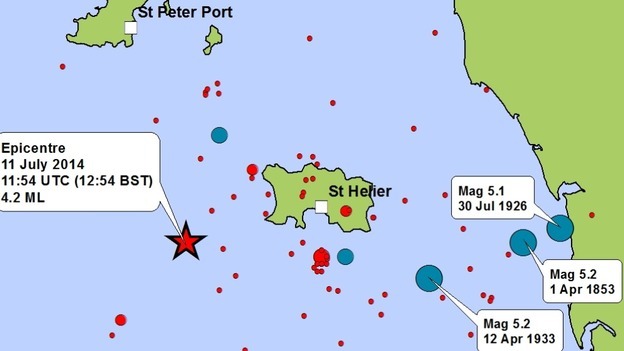 In summary, earthquakes have been recorded from sea bed locations around the island and from several localities on the island for many years and from similar locations recently as shown above. From the map, it can be seen that in general, they are within 25 km (15 miles) of Jersey with some further afield southwards and north westwards. Since 2000 they have occurred in approximately the same areas and show a loose cluster to the NW, an approximate linear spread to the east and SE along La Déroute between Jersey and the Cotentin Peninsula, and a cluster south of St. Helier with isolated ones having occurred to the west and south west of La Corbière. They have never been very powerful but have ranged from 1.0-1.9 to 3 on the Richter scale and been strong enough to shake off loose roof material and rattle sash windows and crockery. The most recent report, accompanied by a seismogram (Johnson, 2009, p.47) shows that in 2008 there was one local 'quake on Jan. 12th '08, 14km (c.9 miles) SE of Jersey (La Rocque Pt.) 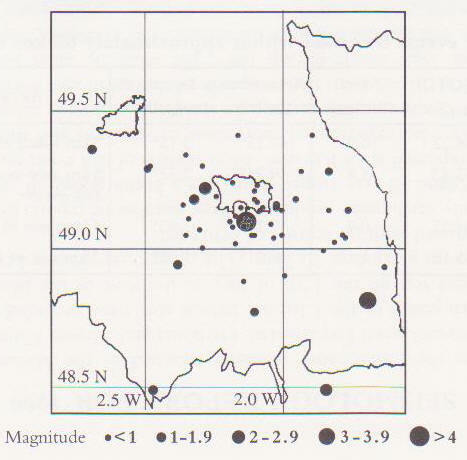 with a magnitude of 1.1 (Richter), indicating that the fault in this area continues to be active. Two others, further away in France, at 65 km (c.40 miles) SW of La Corbière and at 37km (c.23 miles) NE of Gorey on March 20th (1.5) and Nov. 17th (1.8) respectively were a little stronger. None of the events produced any 'felt reports' in the island. The localities correspond in general to fault lines shown above on the French geological map (BGRM, 2003), for example, an E-W striking fault off the south coast of the island, several faults of different strikes between Jersey and the nearby coast of Normandy south to Granville and there is one inferred fault recorded corresponding to the 'quakes located NW of Grosnez. 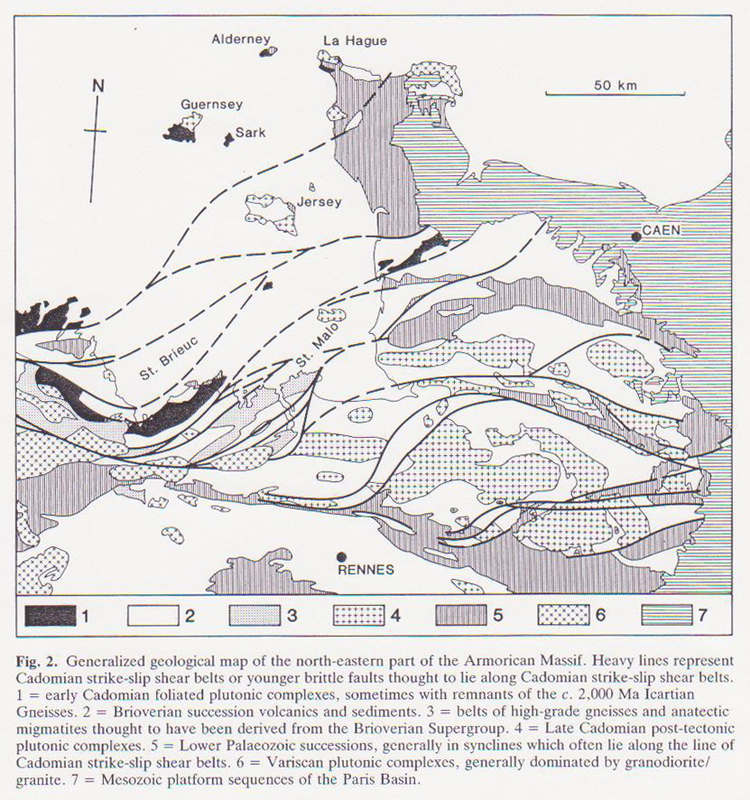 Sinistral tear faults around Jersey (Brown et al, 1990). Recent earthquake epicentres (BGS & F. Le Blancq). Johnson, P. 2000. Seismology Report for 1999 (includes events 1990 - 2000). Bull. Ann. Soc. Jersiaise. Vol. 27, Pt. 4, pp. 591 -592. Johnson, P. 2009. Seismology Report for 2008. Bull. Ann. Soc. Jersiaise. Vol. 30, Pt. 1. p.47. Le Service Géologique National. 2003. La Carte Géologique de la France, 1:1,000,000, 7th. Édn.